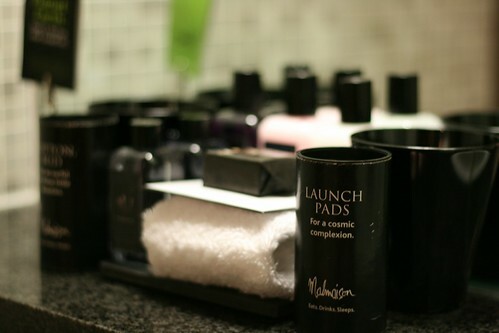 Malmaison hotels ‘dare to be different’, or so they claim. I was intrigued before my stay and wanted to see how. Upon entering the dimly lit and darkly coloured reception area, I got the gist of what was to come. A rude painting hangs above the stairs that go down to the brasserie and the black and red decor sets the scene. I was pleasantly surprised to see a huge kingside bed, plasma screen TV, CD and DVD player in the room. The hotel staff had even left two bars of Flake ‘allure’ on the bed. The bathroom was sleek but there were no stand out features – except of course the toiletries that you are encouraged to use and take home with you. The fact that they provide you with a bottle of massage oil tells you a little bit about the ways in which the hotel group ‘dares’ to be different. We arrived at the brasserie for dinner and perused the menu. Due to the location (Farringdon), I imagine that the biggest customers are business men, which is probably why it wasn’t busy on a Friday evening. I turned the menu over and saw that Maldon Oysters are one of the suppliers, but became confused as I turned the menu over again and they were nowhere to be seen. I asked the waitress who told us that they are suppliers but they only occasionally have them on the menu. She went away and returned 5 minutes later to tell us that the Fox & Anchor a few doors down (a traditional London watering hole with a boutique hotel upstairs, also a part of the Malmaison group) had some in the kitchen and they would be sending six over especially for us. Now that’s service for you. 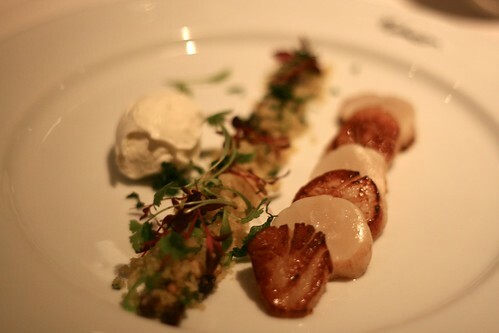 Alongside the Maldon Oysters (£2.30 each), we also ordered the seared scallops (£7.95) for starter, which were lovely and tender. We weren’t so sure about the raisins in the cous cous but overall it was a pleasant, delicate dish. 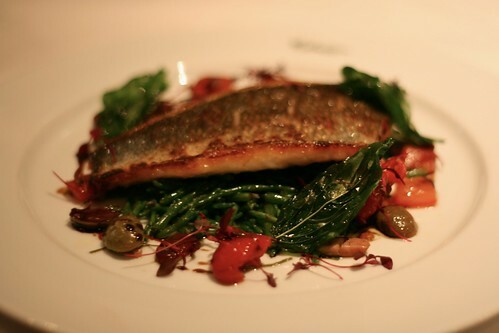 For mains we ordered the pan fried sea bream with samphire special (£16.95), alongside the Donald Russell aged entrecôte steak (£20.95), which I ordered medium rare. Samphire has become very fashionable of late – I have had it a few times at restaurants recently and even cooked with it at home. The samphire that came with the sea bream at Malmaison was slightly too salty. It’s a sea vegetable so is naturally very salty but I imagine the chef probably added extra. It also wasn’t as crunchy as I would have liked but the fish was delicious and cooked perfectly. The steak was just slightly too over done for me – it was pink in the middle but I would say it was more medium-well done. 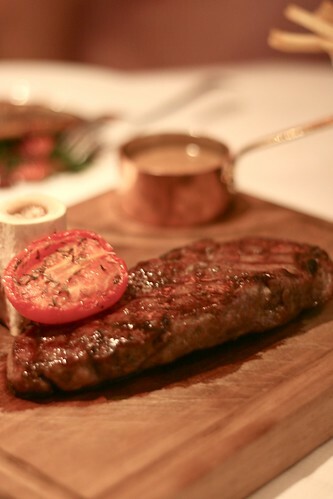 Nevertheless I enjoyed it, especially the rich herby béarnaise sauce that came with it in a beautiful little copper pot. 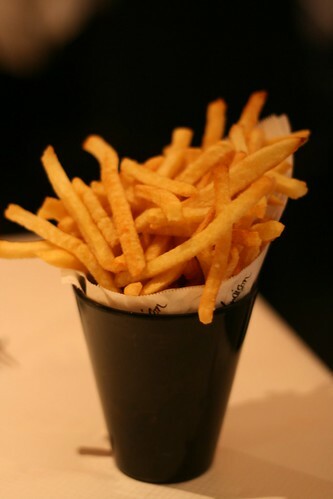 We shared a rocket and parmesan salad and a portion of chips (£3.50 each) with our mains and both were good. The chips were not piping hot when they arrived at the table, which is always a bit of a bug bear of mine but the rocket salad was delicious. It was great to see a bottle of Monti sabini vorroni olive oil on our table – we drizzled a bit over the rocket salad to top it off. Despite being pretty full, we ordered a white chocolate cheesecake (£5.95) and an affoato (£3.95) to share for dessert. The cheesecake arrived and I was a little disappointed. 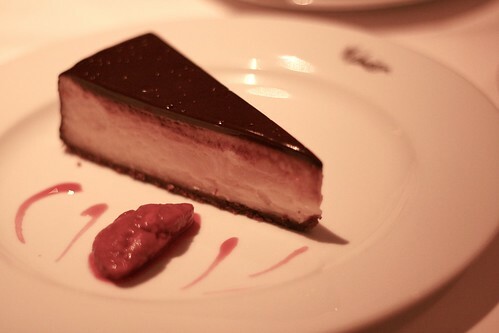 It didn’t look homemade (I forgot to ask whether it was made in the restaurant kitchens) and it wasn’t as creamy and tempting as other recent cheesecakes that I have eaten in restaurants. The macerated raspberry that was on the side was a bit too tart for me. Overall, not a winner. 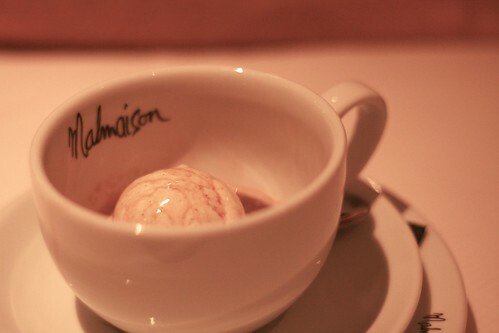 The affogato was delicious and the ice cream had beautiful specks of vanilla pod in it. As if we hadn’t already eaten enough food, the cheese trolley made an appearance at the end (£8.50 for a selection). Oh dear I thought. 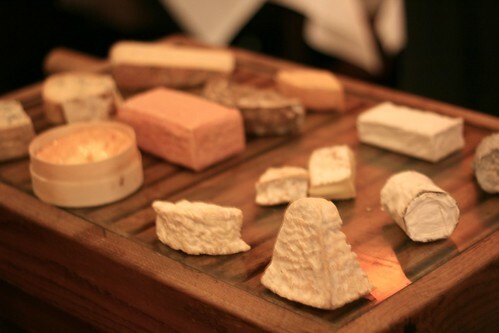 We had a small selection of Epoisse, Golden Cross, Marual and Soft bath. 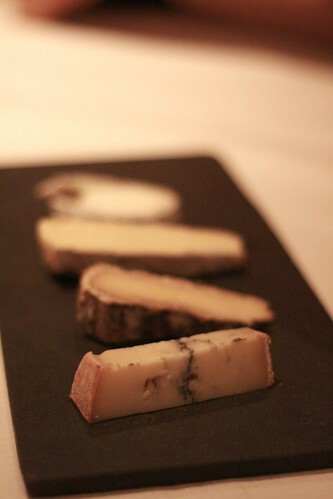 I thoroughly enjoyed all of them, but particularly the Golden Cross Goats cheese. 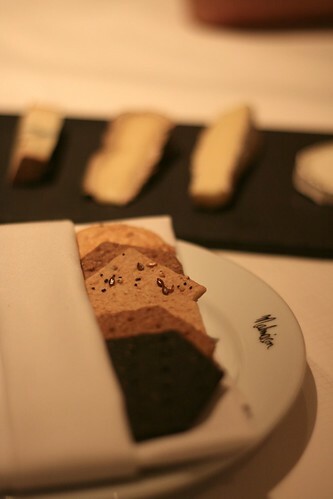 I love cheese trollies and I was so happy to see such a well stocked one at the Malmaison Brasserie. The waiter was also very knowledgeable and a pleasure to listen to. After a very comfortable nights sleep in the large air conditioned room, we wandered down to the Brasserie for breakfast (included in the price of the room at weekends) and it was full so we had to wait 20 minutes for a table. When we were eventually seated, a pot of tea and a cup of coffee were brought over to us straight away before we ordered the waffle with nutella and grilled banana and eggs benedict. I had to ask for the nutella when the waffle arrived but it came shortly after, melted in a copper pot. Delicious. The eggs benedict was also very good, extremely moreish and actually just the right size for breakfast. After a quick read of the newspapers provided by the Brasserie, we handed our key back to the receptionist and left – full, satisfied and rested. Malmaison also has a private dining room, The Butchers Block. 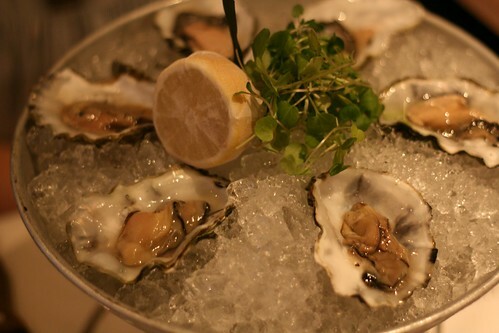 Read about London Eater’s experience here. Food For Think was a guest at Malmaison London. 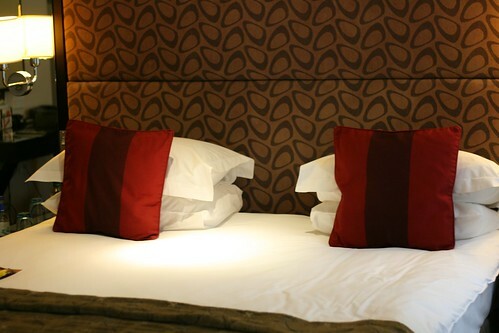 Superior Doubles from £265 per night.